At the beginning of August I took a field trip to Bradford County, PA through the towns of Ulster and Towanda. Lots of drilling activity going on there: tankers pumping water from the Susquehanna, construction crews preparing impoundments and well pads, and a few wells. 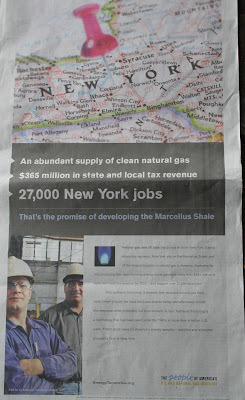 According to my local guide, Marcellus drilling has just started in the area. But already there has been a lot of road damage. 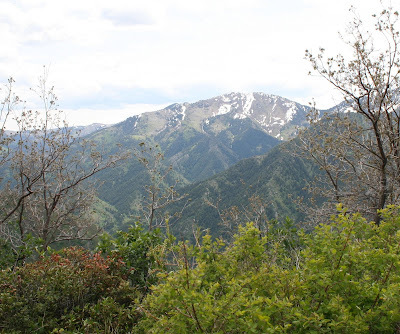 We drove along one road (shown in photo) which, until the drilling had begun, was paved. There was not a lick of asphalt to be seen, however; it had been ground to dust. 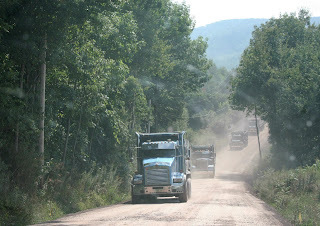 But there was a continuous train of dump trucks hauling dirt and gravel, and road machinery to grade and roll the surface so that the residents had a smooth dirt road to drive on. By May the drilling was pretty much done and residents figured that the road repair would be happening soon. A road construction company did eventually put down a layer of crushed gravel, but the road was never completed. "They told our highway superintendent that they wanted to put off completing the road repair till they had drilled into Marcellus," said Van Etten Town Supervisor George Keturi. Problem is, Epsilon won't be drilling into Marcellus anytime soon - maybe as long as another year before they get those permits. That's not good enough for the people who live there and whose children ride the school bus back and forth on that road. So at the August 12 town board meeting one of the residents told the board to force the company to repair the road. As of yesterday Epsilon has agreed to do the repairs. Meanwhile, Epsilon's failure to take their promises to fix roads seriously has sent the wrong sort of message to the town board. While neighboring town boards are sending resolutions to the State Legislature urging them to refrain from voting on a drilling moratorium, Van Etten's town board has not. Says supervisor Keturi, "Because of what happened, our town board will not be signing any resolutions supporting gas drilling." Experts at Penn State and Cornell advise homeowners to test the drinking water in their wells prior to gas drilling. This "baseline testing" offers a standard for comparison in case anything happens to water quality during drilling on their - and neighboring - land. Some people, though, wonder whether - and how - such baseline testing might be applied to rivers and streams. With increased industrial activity from shale gas extraction coming to the area, they want to monitor stream health in areas threatened by drilling. As with drinking wells, they need to create a baseline for comparison. So, for four Sunday afternoons starting August 29, a group of volunteers will meet in the Spencer (NY) library to learn about water testing techniques. Then they'll head to the local streams and begin testing the water. Dr. Steve Penningroth, of the Community Science Institute in Ithaca, has generously offered to provide the training. Penningroth currently trains and works with volunteers monitoring the water quality in six tributary streams of Cayuga Lake. 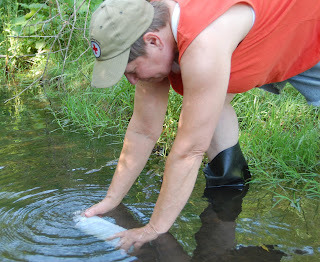 Because the area is agricultural, volunteers test streams for nutrients (phosphorus, nitrogen and potassium) as well as sediments land coliform bacteria. Testing water for contamination related to drilling is a bit more complicated, Penningroth said. He's developing a list of water quality tests that are simple enough for volunteers to do while in the field. Penningroth's short list of basic chemical tests to monitor stream health include: turbidity, which indicates the amount of particulate matter in the water; pH (acidity); the conductivity, which reflects the amount of dissolved solids or chlorides in the water; dissolved oxygen, a good measure of the amount of oxygen available to aquatic life; and hardness, indicating the levels of calcium, magnesium and metals. “We’re also hoping to do biological monitoring,” Penningroth said. “Monitoring aquatic insects will tell us a lot about the ecosystems.” Whereas a chemical test is like a snapshot – indicating water conditions at the time the sample is taken – sampling aquatic insects gives information about water quality over a period of weeks. A community of insects lives in a specific habitat and volunteers will use NY Department of Environmental Conservation (DEC) guidance documents to aid with this aspect of the monitoring. In the end, Penningroth hopes to develop a suite of tests that are tailored to the shale gas industry but inexpensive enough for a community to adopt. 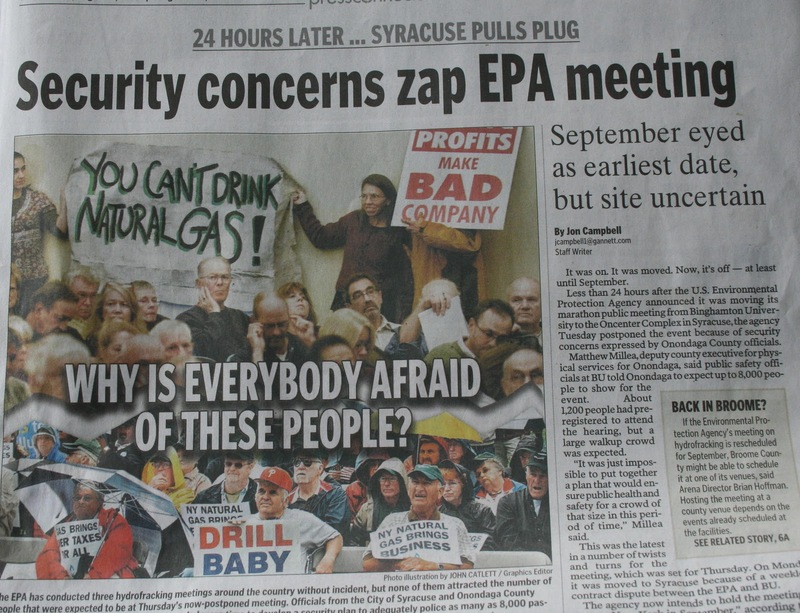 Yesterday's daily news (Press & Sun Bulletin out of Binghamton, NY) carried three front-page articles about the EPA public hearing that never happened in NY. This is an important meeting for all stakeholders - landowners, industry representatives, researchers and environmental advocates were looking forward to an opportunity to share their thoughts about the EPA's study on fracking. So, the articles attracted lots of eyeballs from all sectors of the reading public (at least those who get newsprint on their fingers). What struck me, though, is that all the articles continued to an inside page, and opposite them was this full-page ad. Not sayin' anything. Just makin' an observation about "product placement". But a fellow journalist points out that placing an ad for an industry next to the jump page for controversial articles about that industry is not kosher (read his comment below). Months ago the EPA scheduled four hearings across the country to gather public comments regarding their about-to-be-started study on hydraulic fracturing. There was a hearing in Colorado, a hearing in Texas, a hearing in Pennsylvania. The final hearing was scheduled for Binghamton, NY this Thursday - tomorrow. On Monday - just four days prior to the hearing - the EPA decided to move the venue to Syracuse. Why? According to Carolyn Gillette, one of the many people in charge of planning, registration etc, "the last minute change to Syracuse was caused by Binghamton University taking several actions to dissuade EPA from holding the meetings at their campus, including increasing the cost from $6,000 to almost $40,000." A hefty price tag for the taxpayer, no doubt. The change in venue - and increase in cost - may have had something to do with two rallies being planned for that same day. Environmentalists had invited some bands and speakers (congressmen, film stars and other celebrities) and planned to stage a rally in one of the parking lots. Not to be upstaged, the pro-drilling crowd pulled together their own rally. And the folks at Binghamton University started counting heads (1200 registered for hearing plus another 5,000 or so for the rallies) and they started tallying up the costs for security, and things got .... expensive. So EPA pulled a switcheroo - moving the hearing to Syracuse. Which meant a couple extra hours of driving for some folks, re-negotiating the bus transportation for those trying to reduce their carbon footprint, canceling and making hotel reservations...... But by Monday night people were already figuring out carpooling. "Hold the phone," said a friend when I offered to drive. "Let's wait and see if they intend to stay in Syracuse." Why wouldn't they stay, I wondered. I mean, this is the EPA, and this hearing has been scheduled for months, and they really do want public input ... don't they? Apparently not - or at least not yet. 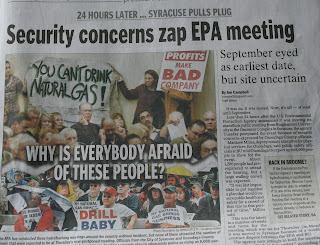 Mid-morning Tuesday we got the news that the EPA had canceled the hearing in Syracuse. No, they weren't moving to another venue. They weren't holding it on the 12th. At all. Surely, this was a joke. But no. Says Carolyn Gillette, "EPA was forced to cancel the August 12th meeting following a conversation this morning with the Onondaga County Executive’s office, during which concerns were raised about the ability to complete security preparations for the meeting on such short notice...... Onondaga County officials did not feel they could arrange the necessary security for protecting people and property with ongoing rallies outside the meeting site." But don't worry, she said. We'll hold the hearing in September. On some (as of yet undisclosed) date at some(as of yet undisclosed) location. Oh - and for those of you who registered to present oral comments? well, you'll have to register again - once we set that up. Kind of unfair to those who expected to have an opportunity to speak to the EPA. However, people who believe in all that's good in democracy sent numerous emails of protest and, a few moments ago Carolyn G. advised them that, yes, if they were already registered to speak they may retain their speaking slot. Now all that's needed is a place to meet. response to 911 calls may take awhile. The NY Department of Environ-mental Conser-vation (DEC) hasn't completed the SGEIS (Supplemental Generic Environmental Impact Statement) yet for high-volume hydro-fractured wells in the black shales. But that doesn't mean companies have stopped drilling. 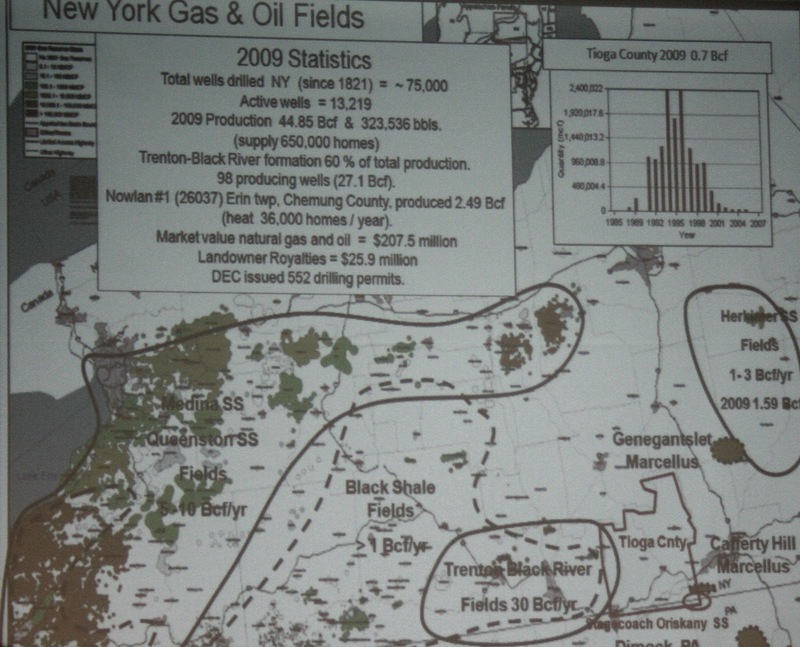 Don Zaengle, a petroleum geologist who spent 20 years with Shell Oil Company, told Tioga County (NY) landowners that DEC issued more than 550 permits last year. "Companies are drilling into Oriskany, Trenton Black River and other gas-bearing strata under existing regulations that permit vertical wells," he said. 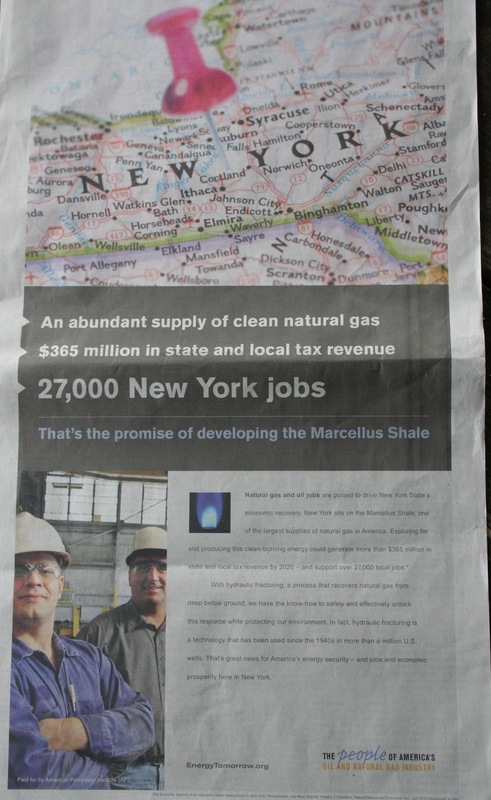 Last year NY wells produced about 45 billion cubic feet (bcf) of natural gas. "That's enough to heat 650,000 homes," Zaengle added. The number one producer last year: the Nowlan 1 well in Erin, a small town in Chemung County. "Despite what you hear about a moratorium, there's significant activity going on in the state,” Zaengle said. Of course, he added, there's much more drilling activity in PA because Marcellus is where many of the companies want to invest their drilling energy. "Unfortunately, Cabot has done a lot to create bad publicity for Marcellus exploration," Zaengle said, criticizing what he feels has been haphazard drilling in Dimock. "Their operation there is not clean, good quality production. He hopes the company will go to more ‘environmentally friendly’ drilling in the future - placing six wells on a single pad instead of the current scattering of vertical and horizontal wells across the landscape. Still, Zaengle noted that geologists have learned much from Cabot’s production figures. Wells in the 7-square mile Dimock gas field are producing 100 million cubic feet (mmcf) each day. "At $4.75 per thousand cubic feet (mcf), that gas is bringing in $475,000 each day - $173 million per year," he said. The length of lateral well bores has increased as well, Zaengle said. He claims that most horizontal wells in PA are being drilled with 5,000-foot laterals, and that Range Resources has been drilling 7,000-foot laterals. 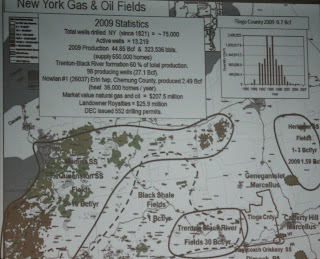 They do 18 stages of frack, Zaengle pointed out. Ironically, as companies pursue gas trapped in the tight Marcellus shale, one of the most productive wells drilled in PA is in the Purcell limestone. Over the past two and a half years 43 companies drilling into Pennsylvania's Marcellus Shale accrued 1435 violations - and possibly more - says the Pennsylvania Land Trust Association (PALTA). Using records obtained from the PA Department of Environmental Protection (DEP) PALTA identified 952 violations they judge as "having the most potential for direct impact on the environment". Those do not include violations incurred by wastewater haulers (who racked up more than 1,000 violations in an enforcement blitz in June). The report also lists the 25 companies with the most violations and the 25 companies with the highest average number of violations per well driller. Leading the pack for violations are: East Resources (138 violations for 140 wells), Chesapeake Appalachia (118 violations for 153 wells), Chief Oil and Gas (109 violations for 45 wells) and Cabot Oil & Gas (94 violations for 60 wells). Many of the companies had, on average, more than one violation per well drilled. JW Operating led the list with 11 violations for one well. Chief Oil and Gas had an average of 2 violations per well and Chesapeake came in at the bottom with 0.8 violations/well drilled. 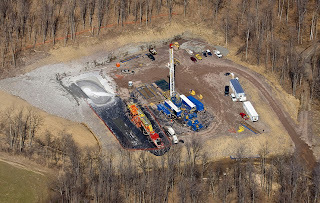 It took a few months, but the Pennsylvania Department of Environmental Protection has fined Talisman Energy (formerly Fortuna) a modest $15,506 for a spill of used natural gas drilling fluids that occurred last November at its Klein gas well pad in Armenia Township, Bradford County. According to a DEP press release, that spill polluted a waterway too small to be named. DEP notes that the spill involved hydraulic fracturing flowback fluid - the stuff that returns to the surface after drillers inject the pressurized mix of water and chemicals underground to fracture a geologic formation in order to allow natural gas to flow. 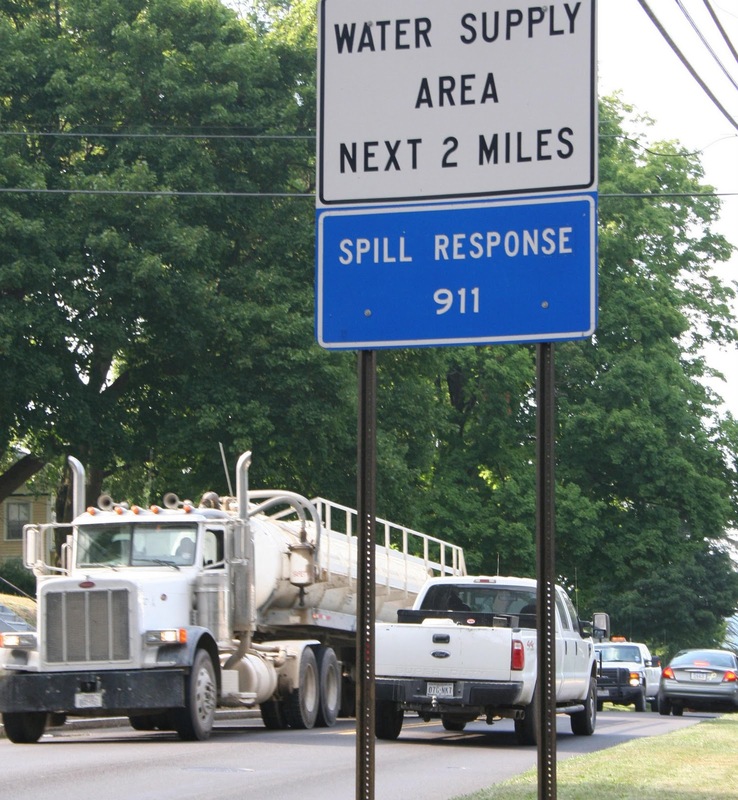 DEP’s investigation in late November 2009 determined that Talisman spilled between 4,200 to 6,300 gallons of fracking flowback fluids when a pump failed and sand collected in a valve,” said DEP North-Central Oil and Gas Program Manager Jennifer Means. The fluids flowed off the well pad and toward a wetland, with a small amount discharging into an unnamed tributary to Webier Creek. Webier Creek drains into the upper reaches of the Tioga River, a cold water fishery. DEP noted that Talisman has successfully completed DEP’s Act 2 process for spill cleanup activities.